Today, British journalist Helen Soteriou and the award office visited Astrid Lindgren’s apartment at Dalagatan 46 in Stockholm. Our host was jury member Annika Lindgren, who generously showed us around in the home where Astrid Lindgren lived from 1941 until her death in 2002. The apartment is not generally opened to the public. 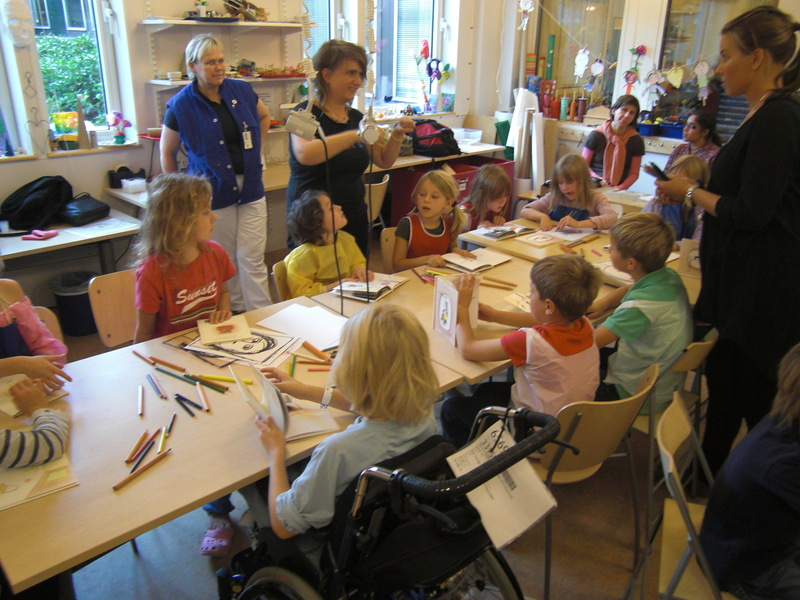 However, if you are a member of the Astrid Lindgren Society, you are able to join one of their visits. Also, there is a virtual tour available on Astrid Lindgren’s official webpage, this way you can see the home without even traveling. One thing that strikes the visitors is that Astrid Lindgren, even though she achieved enormous success during her life time, never moved to a more fancy place. It’s a humble apartment, but it’s a very homely one. Filled with books in every room! 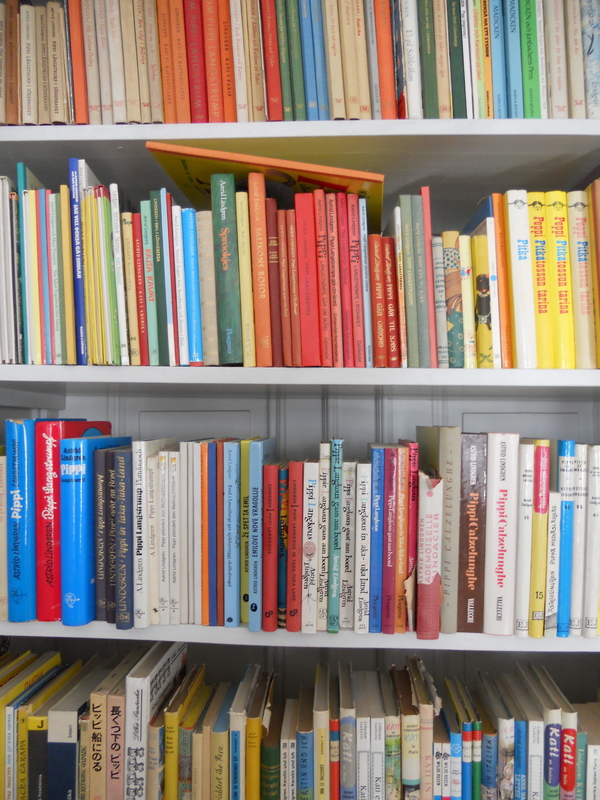 And of course, gifts from children and presidents alike, awards (Astrid Lindgren received more than 100 …), original illustrations by artists such as Ilon Wikland, Ingrid Vang Nyman and Björn Berg, and first editions of her own books in many different languages (as seen below). 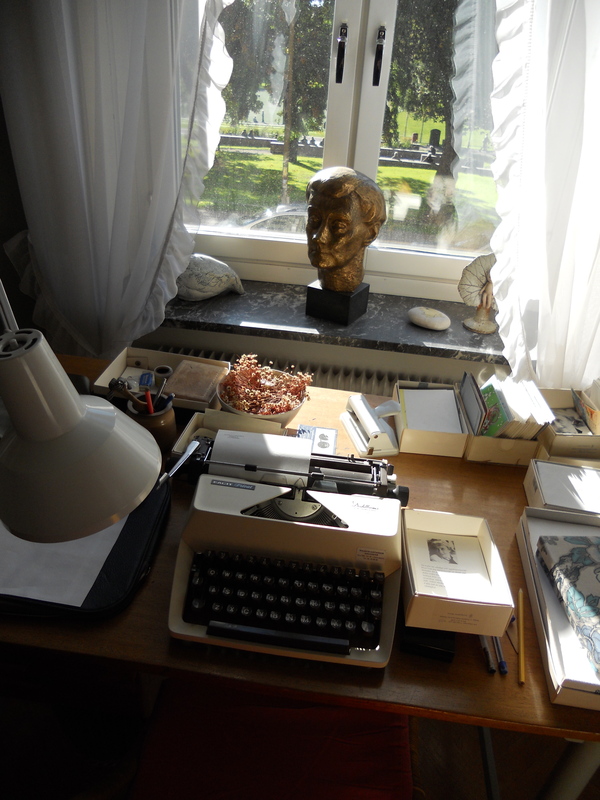 In one room, with a view of the park, the typewriter on which she typed her letters and manuscripts still sits, as if Astrid Lindgren just walked out the room. How is the Swedish picture book doing? Today, jury member Ulla Rhedin tries to answer this question together with picture book artist Anna-Clara Tidholm at Book Café Pilgatan in Umeå, in the north of Sweden. Anna-Clara Tidholm, famous for her Knock Knock-series, has been nominated to the Astrid Lindgren Memorial Award several times. If you don’t have the opportunity to make it to Umeå tonight, on your next visit – don’t miss Book Café Pilgatan. Run as a cooperative, it defies the current trend in book industry and fokuses on a quality selection, author readings, workshops and cultural meetings. At the Frankfurt Book Fair, the French-German TV-channel ARTE will host a presentation of the Astrid Lindgren Memorial Award (ALMA). The journalist Matthias Schneider will interview this year’s winner Kitty Crowther, Judith Drews from Illustratoren Organisation who nominated Kitty Crowther to the Award, and Erik Titusson, Director of ALMA. The venue is: Exhibition site, 3.1 Foyer West at 1pm on Friday the 8th of October. Four prominent picture book artists from Africa met today in a seminar at the Gothenburg Book Fair. The seminar was moderated by jury member Lennart Eng, who gave the audience an introduction into the art of Piet Grobler, Véronique Tadjo, Christian Epanya and John Kilaka. Piet Grobler grew up on a farm in South Africa, studied theology and worked as a priest until 1989 when he switched to journalism and graphic design. Since he began illustrating he has published several books, among them Today is my day, Colors! and Makwelane and the crocodile, with text by Maria Hendrichs. 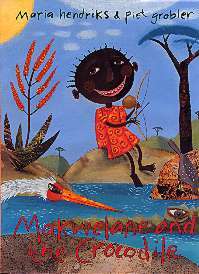 Makwelane was recently published in Swedish by Hjulet and Piet Grobler received the 2010 Peter Pan Award for this book by the Swedish section of IBBY. Véronique Tadjo has been nominated to the Astrid Lindgren Memorial Award many times. She comes from the Ivory Coast but lives and works in France. As Véronique had written her first picture book text, her intention was that her mother, an established artist, would illustrate it. But her mother never got around doing it. That’s how she began illustrating herself, something her fans are grateful for! 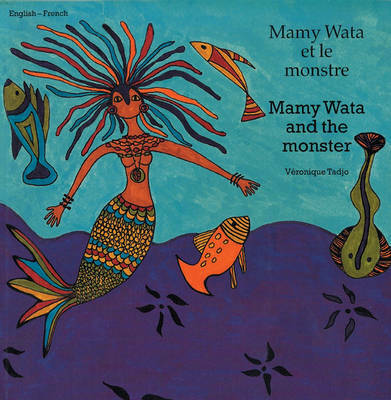 Since then, many books, such as Mamy Wata and the monster, Grandma Nana, The lucky grain of corn and Talking Drums, have seen the light of day. In recent years Véronique Tadjo has mainly been painting, but during the seminar she revealed that she is currently looking for a way to get these paintings onto the page. Christian Epanya from Cameroon lives and works in Lyon, France. He started by illustrating other author’s text, but in recent years he’s been focusing on making books on his own. His book Le Taxi-Brousse de Papa Diop, was published in Sweden by Trasten and became an immediate success. 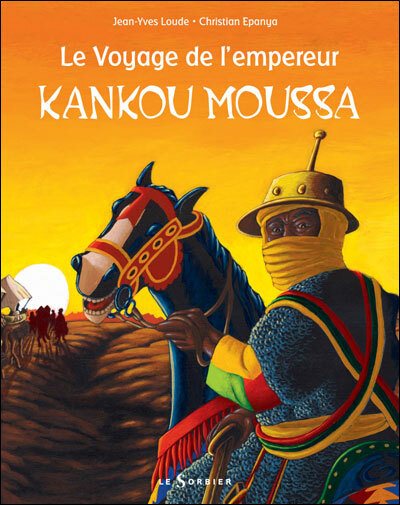 His other books include Le Petit photographe de Bamba and the recent Le voyage de L’Empereur Kankou Moussa. In Christian Epanya’s books, each image is a world in itself, in which the reader can navigate. John Kilaka’s career as an illustrator started on the blackboard in school, where he would illustrate jokes for his classmates to enjoy. 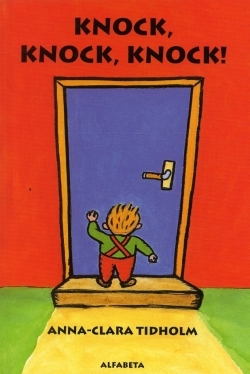 Much to the distraught of his teachers … His first book Fresh Fish came out in 2001 and became an international success. His passion for oral storytelling has led him to begin traveling Tanzania, collecting and illustrating traditional stories. He sees this as a way of saving this heritage for future generations. 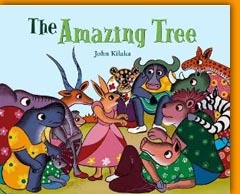 His latest book The Amazing Tree is representative of this project. The seminar was organized by Afrika barn 2010, Svenska Tecknare and the network Den hemliga trädgården. Den hemliga trädgården (The secret garden) was founded in 2003 with the purpose to introduce children’s literature from Africa, Asia, Latin America and the Middle East to the Swedish audience. In time for the book fair, a highly recommendable introduction to African children’s literature written by Sven Hallonsten and Britt Isakson was published by the network. If you read Swedish and are even just remotely interested in literature from Africa, this is a must. It can be easily ordered by e-mailing vbib@solidaritetshuset.se. Kitty Crowther started her second day at the Gothenburg Book Fair with a workshop at Queen Silvia’s hospital for children. Together with Kitty Crowther, the children made very special self-portraits. First, the children made portraits using chinese ink. This image was swiftly copied to overhead film. 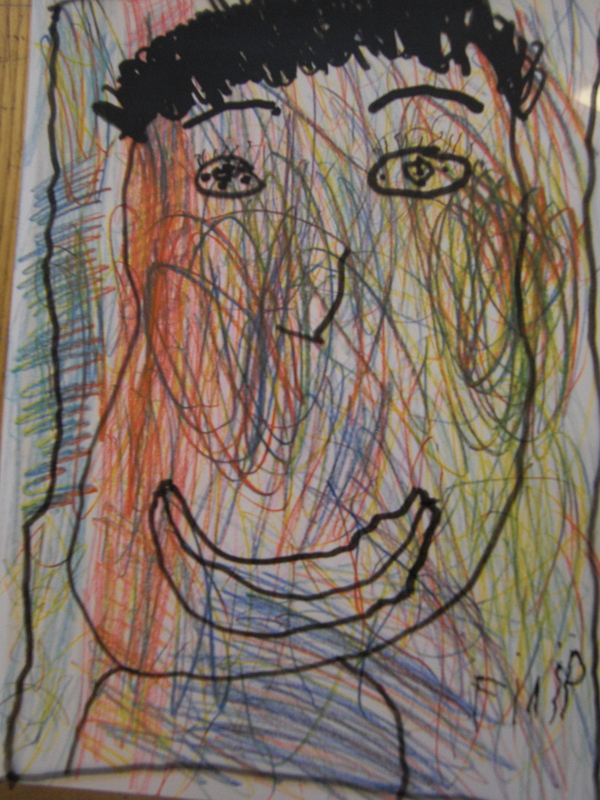 Next, the children each made a second drawing, using colored pencils, onto which the self-portraits were superimposed. Sounds confusing? Not to the children. Here is one of the results! Back at the fair, Kitty had a quick chat with Johanna Lindbäck on the stage at the stand of Rabén & Sjögren. The talk, which was about the familiar little insects Poka & Mine was followed by a signing. 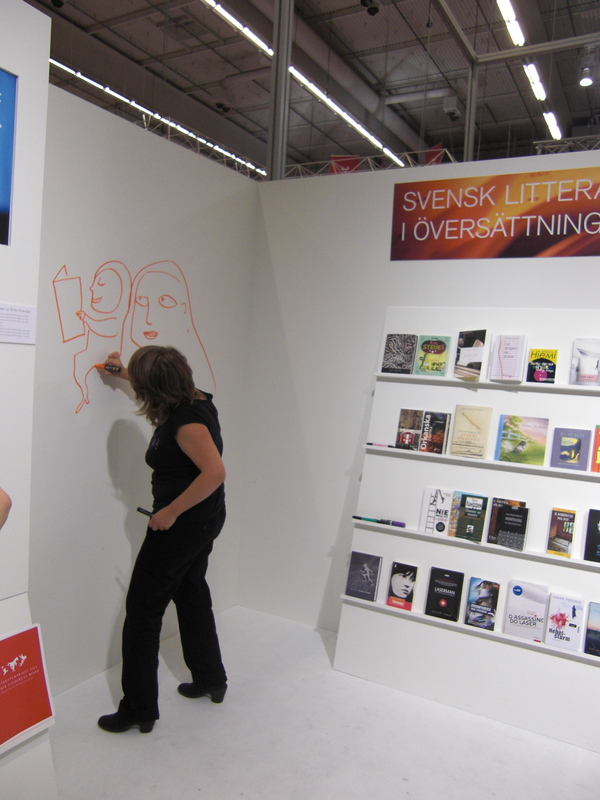 After the live wall-painting, Kitty Crowher met with Swedish Television’s Babel. In this interview, she describes her work as being a film director who doesn’t know how the movie will end. She also talks about the responsibility she feels towards the characters she creates and about the just completed wall-painting. 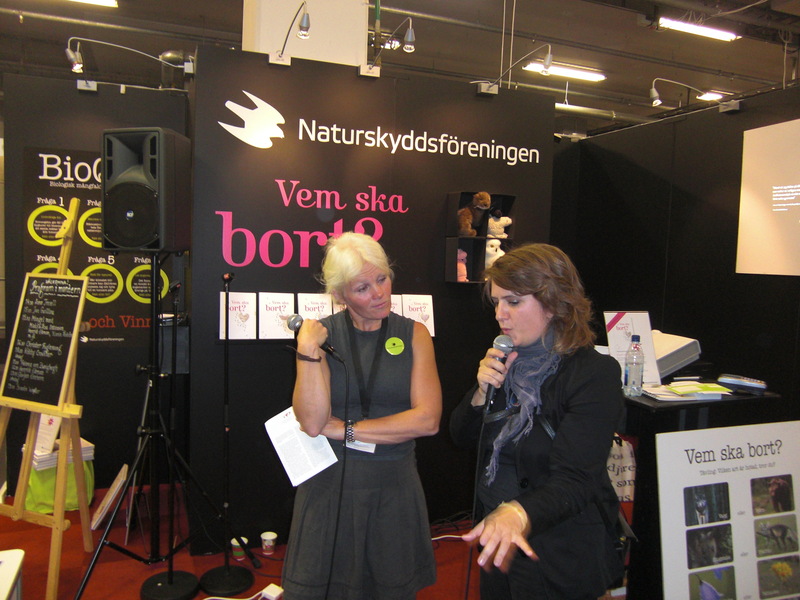 Finally, at the end of the day, Kitty Crowther was invited to the stand of the Swedish society for nature preservation (Naturskyddsföreningen), where she was interviewed about her connection to nature. Kitty revealed that she has a dream project of making a personal encyclopedia of plants and animals and their relationships to stories. That’s something to look forward to! 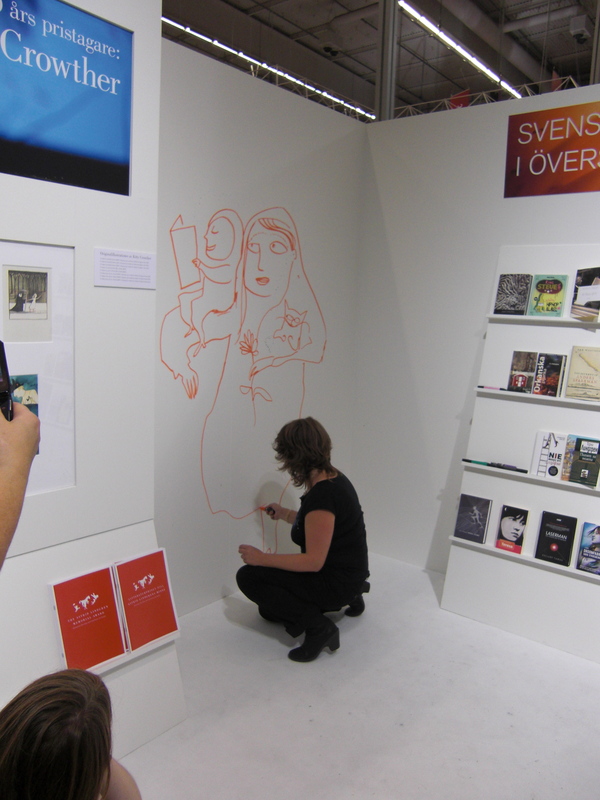 As promised, Kitty Crowther painted the white wall of the Swedish Arts Council’s stand at the Gothenburg Book Fair live in front of a curious crowd. 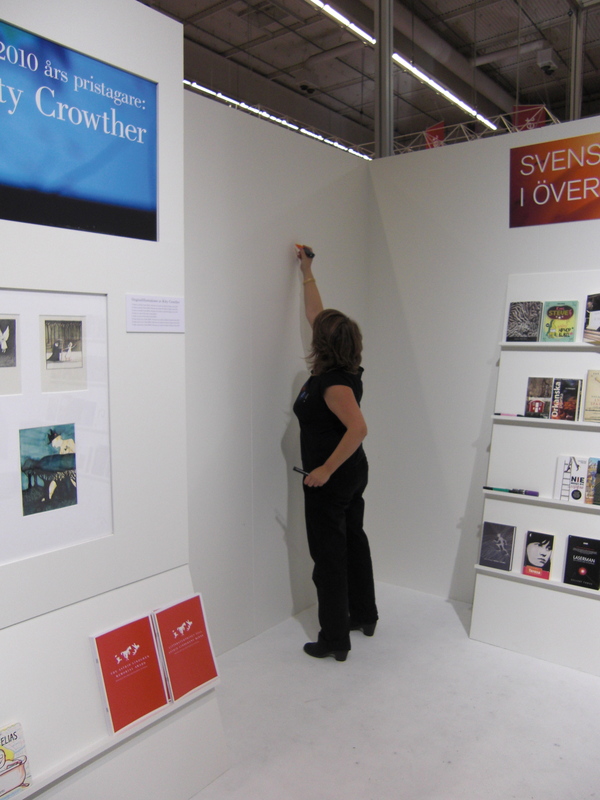 As Kitty Crowther saw the stand of the Swedish Arts Council (C02:02) at the Gothenburg Book Fair for the first time, she thought it was nice … but too … white. 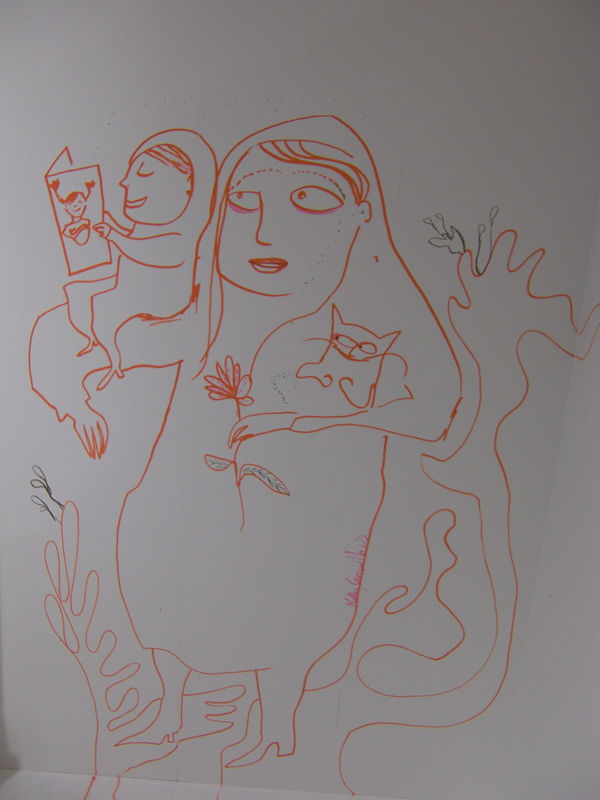 Today at 4 pm that will all change, as Kitty Crowther will draw directly on the wall. 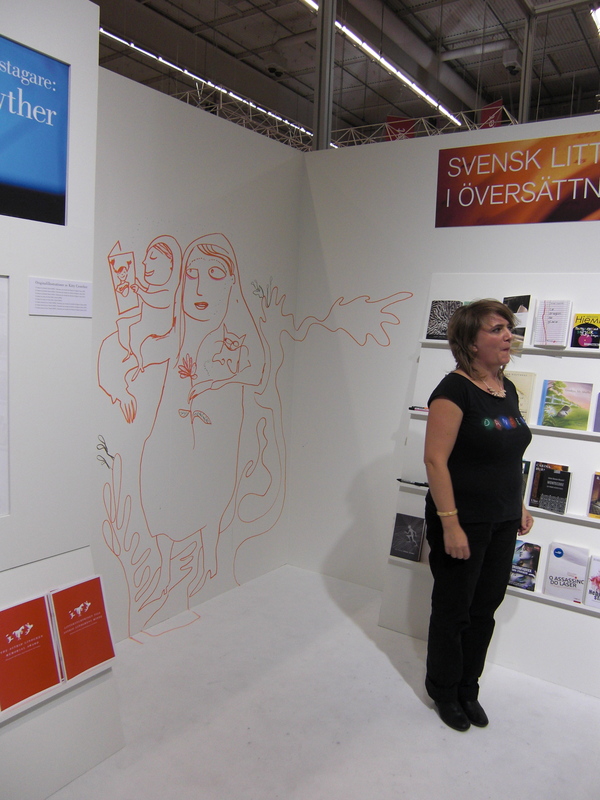 Yesterday was a busy day for Kitty Crowther at the Gothenburg Book Fair. 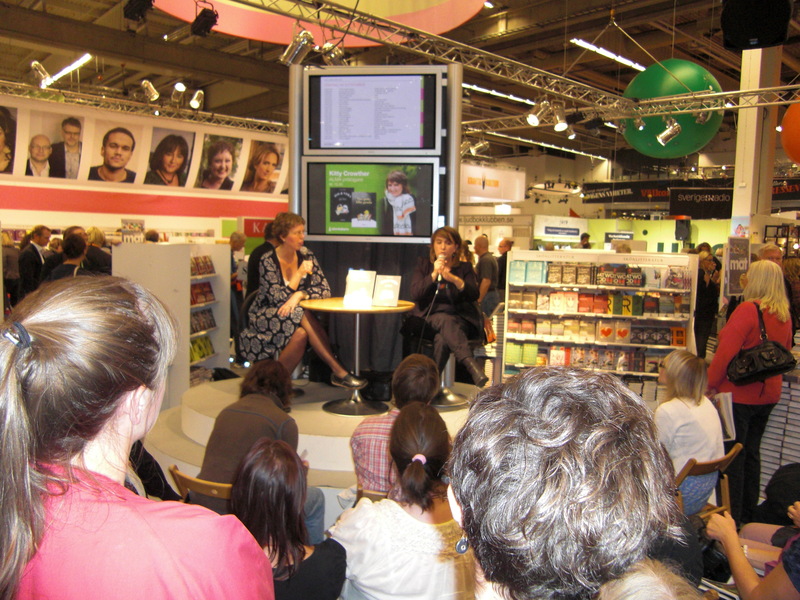 Apart from signings and interviews, she discussed her work together with Johanna Lindbäck and Ulla Rhedin. Plenty of picture book aficionados showed up to hear Kitty Crowther talk about Le petit homme et Dieu for the first time. An interesting part of the discussion dealt with the God-character in the new book, a type of being that has relatives in her earlier books, for example Rien in Moi et Rien. Kitty Crowther talked about her fascination with characters that are in-between, between the ordinary world and the magical, between the human dimension and the spiritual, between something and nothing. The Award Office had the chance to document the special moment when Kitty Crowther received the very first copy of Le petit homme et Dieu from the printers. 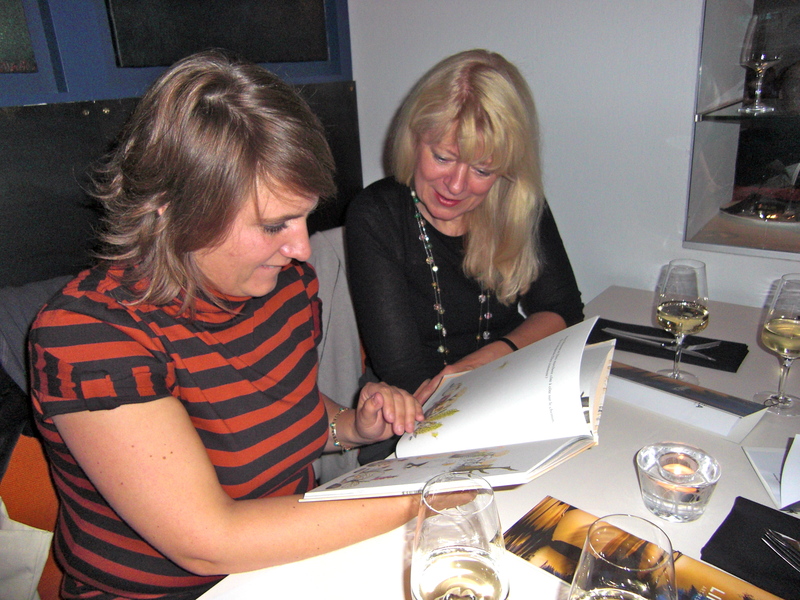 Odile Josselin, publisher at Pastel, surprised Kitty Crowther with the book at a dinner with Swedish publisher Rabén & Sjögren in Gothenburg. And it looks fantastic! The story is sublime, the colors are vibrant and on top of it all it is printed on exclusive Munken by Arctic Paper. The orange color which plays an important role in the book is literally fluorescent. Kitty Crowther will talk about the book for the first time in a seminar together with jury member Ulla Rhedin and writer Johanna Lindbäck at the Gothenburg Book Fair. Today at 3 pm in K3. 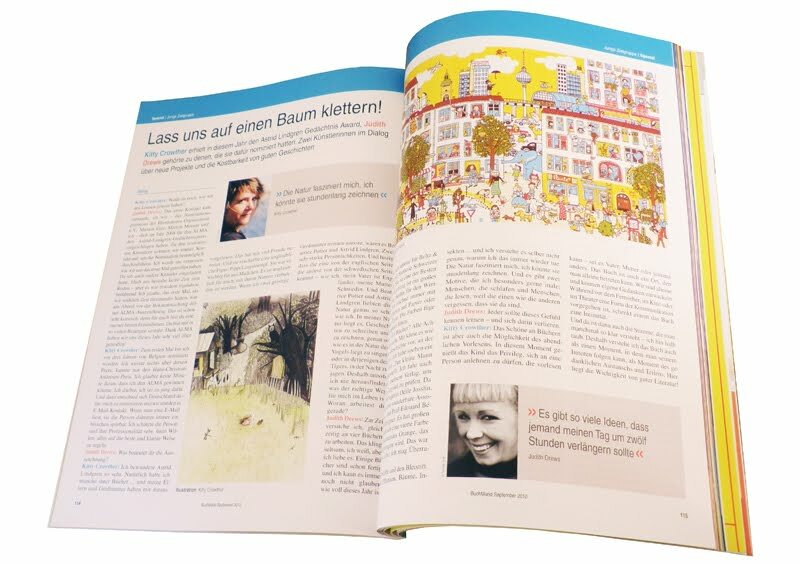 The september issue of Buchmarkt, Germany’s trade magazine for booksellers, comes out just in time for the Frankfurt Book Fair. This year, it has a special fokus on books for the young. 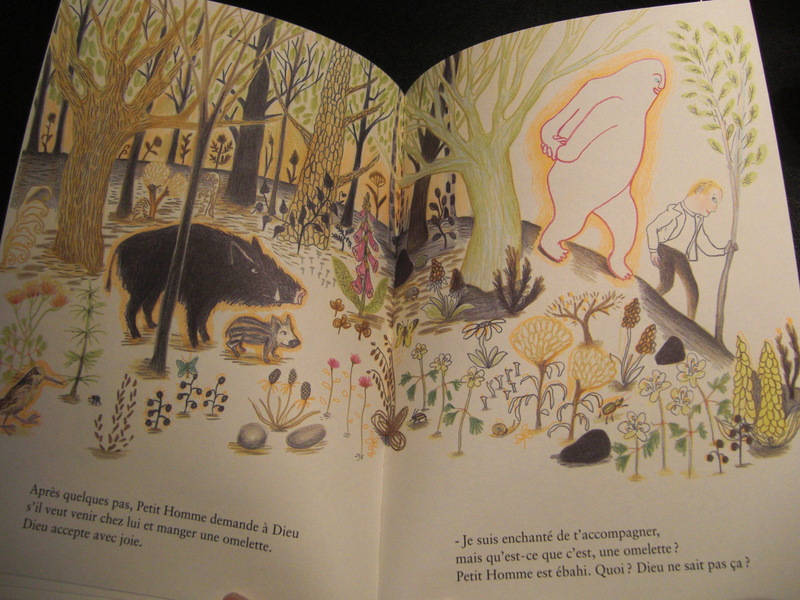 It’s highlight is the meeting between two illustrators: Judith Drews and Kitty Crowther. They discuss the power of storytelling and talk about future projects under the headline: Lass uns auf einen Baum klettern (Let’s climb a tree). Judith Drews is a representative of the Illustratoren Organisation, the nominating body who successfully nominated Kitty Crowther to this year’s Astrid Lindgren Memorial Award. If you plan to visit Frankfurt Book Fair in October, you have a chance to meet the two of them in a live discussion at 4 pm in Hall 3.0 Forum Children.